Reset your diet and reclaim your health! In our super-busy society, it's easy to become overwhelmed. Long work hours, home and family obligations, and everyday stress can make anyone feel tired. Add to that relationship problems, serious illness, or a family crisis, and the flood of stress-related hormones can put some people into a state of constant fatigue. This is known as adrenal fatigue. Adrenal fatigue syndrome affects the adrenal glands' ability to regulate hormones, resulting in body aches, sleep disturbances, and digestive problems. 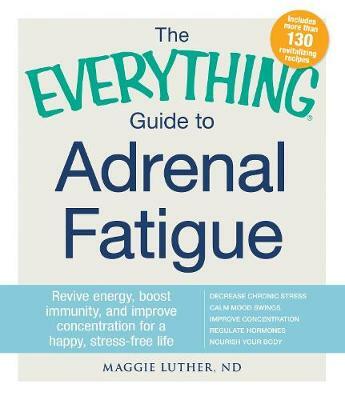 The Everything Guide to Adrenal Fatigue offers a natural lifestyle plan to identify symptoms, calm adrenal glands, and restore energy levels. You'll find more than 100 low-glycemic recipes to help reverse adrenal fatigue, including:Almond Joy SmoothieMini QuichePork Chops with Balsamic GlazeMediterranean Seafood SoupChipotle-Lime Mashed Sweet PotatoesVanilla-Poached Pears Using the information and techniques in this guide, you'll be able to create a personalized nutrition plan guaranteed to return your body to a state of balance and health.